Its the middle of January and by this point many of us have either progressed or given up on New Year’s Resolutions. But I have noticed a trend where people dismiss this idea – it could be because they see it as lame, cliché, they know they won’t stick with or are saying “Well you should have goals all year round”. As someone who used to be in that camp, I will make an argument for why you should be making a New Year resolution. I think they have potential to be powerful. Last year was the first time I seriously thought about setting a new year resolution. Things had got stale in my life, so I made about a dozen and instead of picking one I decided to do them all. Because I was poorly organised I wrote them somewhere and lost them. As a result I can only remember some of them – one was about volunteering, the other was about taking a road trip. Obviously some of the resolutions fell by the wayside. My priorities changed so I did not have time to volunteer (but I did do the road trip, but not as planned). There is nothing wrong with failed resoutions, you either realise you just didn’t want it enough or you can reflect where you went wrong and try again. The third idea, was Just write something. As simple as that. For a resolution, how simple is that? I didn’t say I would write a novel, or start a career as a freelance writer or enter a poetry competition or start a diary. I just told myself to write something. I have no topic to write about. By adopting the just write something philosophy. These reasons were not good enough reason not to write. So I started this blog – The Manifesto of Perfection, which focused on my desire to self-improve. Such a vague resolution, but it inspired action. And despite initial fears that I would run out of things to write about I have managed to maintain a regular writing schedule. With thousands of word of content produced by myself. So why does this make a New Year Resolution a good thing? To me a resolution is creating the habit of setting a goal – no matter how vague this can be developed as the objective progresses. For example to make my writing goal more specific I set targets to write more and impose quality control on my word count. Alternatively with the vague resolution you may find the task a bit tedious, decide it is not for you and focus on what you really want. I have seen criticism from the regular goal setters – sneering because an individual has chosen not to have targets year round. I think setting some sort of goal, no matter the time of year is better than not setting anything at all. They do not have to have a clear plan and can be vague. Details can be developed later on once the resolution becomes habit. It is better to set more than one resolution – I recommend making at least 10. You may not do them all, but this is good as you soon learn what you really want to achieve and what you don’t. 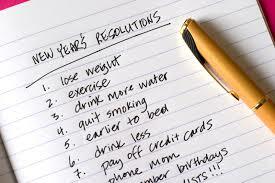 Making a resolution is a way of filling the gaps in are life from the day-to-day tedium. By making a resolution you may address something that is going wrong, find what is missing or decided what you want to do with your life. From that vague resolution I set last year. I had no idea where I was going with it and I am still not 100% sure where I want to go with it. It has been a pleasurable experience, that energises my mind after a tiring day at work and lets me be creative. If you are not in the habit of setting goals, New year’s resolutions are a start. And if you do, I find the New Year is a good way of picking up on objectives that you have been slack with. 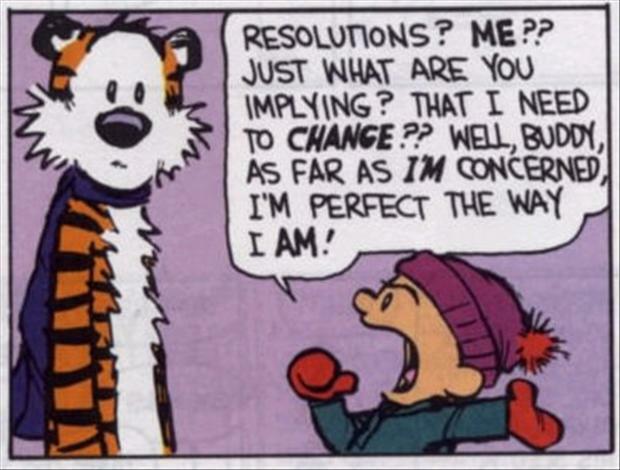 So… have you made a resolution yet? You had me at Calvin and Hobbs. Interesting post!